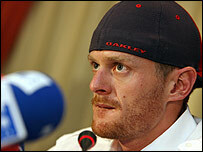 American Tour de France winner Floyd Landis has released an online presentation outlining his defence against doping charges. Landis showed abnormal amounts of testosterone in his body after winning stage 17 of this year's event. The 30-year-old posted the presentation as well as several hundred pages of documents on his personal website. He claims there were a host of inconsistencies in the paperwork and results provided by the laboratory. The presentation, which was prepared by Landis' coach and physician Arnie Baker, claims the French lab erred in its analysis, incorrectly labelled samples and ignored World Anti-Doping Agency testing standards as well as other mistakes. "The whole process has been full of errors," concluded Baker. Landis, who has denied taking performance-enhancing drugs, could be the first Tour winner to be stripped of his title for drug offences and faces a two-year ban from cycling. His motion to have the case dismissed was rejected by the US Anti-Doping Agency last month and he has been formally charged by the USADA. Landis is scheduled to present his formal appeal to a panel from the American Arbitration Society early next year. He could also appeal to the Swiss-based Court of Arbitration for Sport.